The external layer of human teeth, the enamel, consists of micrometer-sized carbonated calcium-deficient hydroxyapatite (bioapatite) crystallites which are tightly packed and hierarchically organized in crystallite bundles (enamel prisms). Compared to other hard tissues in the human body (i.e. dentin and bone), enamel is harder and has a higher degree of mineralization as well as larger crystallites. According to thermogravimetric analysis it contains about 97% Hydroxyapatite (HAP) and only about 1.5% proteins (mainly collagen), and 1.5% water [1, 2]. Therefore, enamel represents the hardest tissue in the human body. Enamel has remarkable mechanical properties such as elaborating fracture toughness and high hardness due to its biocomposite character and a unique structural organization [1-4]. Like many other hard tissues occurring in living organisms [3, 5], teeth are formed in a complex biomineralization process by specialized cells under genetic control. While the general process in many natural systems (including e.g. human bones and teeth, Sponges, Molluscs, and Crustacea) is quite well understood, detailed knowledge is often still limited to date, especially in the realm of proteins involved. Proteins are essential for controlling biomineralization processes and each of these systems requires its own set of different proteins. To recapitulate the enamel formation process, organization of enamel crystallites takes place before a tooth erupts [6, 7]. Besides other cells, mainly ameloblasts produce the known non-collagenous proteins that are involved in amelogenesis, such as amelogenin, enamelin, ameloblastin, amelotin, and certain proteinases that are encoded by AMEL, ENAM, and AMBN. All of these genes belong to the Secretory Calcium binding Phosphoprotein gene family (SCPP) arising from the same single ancestor gene SPARCL1 [6, 8]. Ameloblasts incorporate calcium and phosphate. In metabolic pathways where the proteins mentioned above are involved, intermediate stages and finally HAP-crystals originate . Every ameloblast generates a Tomes-appendix growing in the dentine-direction. Around these appendices, apatite-crystals organize into prisms that constitute the enamel. As soon as a certain thickness of enamel is reached, the Tomes-appendices are formed back. The ameloblasts now convert to the terminal epithelium representing the cuticula dentis. After eruption of teeth, this cuticula dentis gets eroded by shear forces . Consequently, the enamel layer of erupted teeth cannot regenerate and is supposed to last life-long. Approaches to regenerate destroyed enamel are an emerging field in regenerative dentistry and are the subject of the work of several research groups [9-11]. In the oral cavity, enamel is exposed to acids mainly under two conditions: Either enamel can be eroded by acidic food or beverages (acid erosion), or the enamel crystallites can be partially demineralized within the caries process in dental plaque . The critical pH-value for enamel dissolution is about 5.5. However, the solubility of enamel also depends on the amounts of calcium and phosphate ions in saliva or plaque . Chemical analysis of unstimulated saliva reveals that it contains between 0.5 - 2.8 mmol/L calcium and 2 - 22 mmol/L phosphate. Stimulated saliva presents 0.2 - 4.7 mmol/L calcium and 1.5 - 25 mmol/L phosphate . For the HAP constituting of the enamel, it is important that calcium and phosphate are abundant enough to generate a supersaturated state of the saliva. Thus, the enamel surfaces can be remineralized by precipitation of calcium phosphate . A general requirement for remineralization is calcium and phosphate ions passing the protein-rich pellicle layer to reach the enamel surface. The suggested mode of action is that calcium ions interact with glycoproteins (statherin, histatine, acidic proline-rich proteins and others), forming a complex which is termed precipitin . Precipitin is embedded in the pellicle serving as natural calcium-reservoir . However, remineralization from saliva cannot replicate the complex microstructure of enamel. Furthermore, remineralization from saliva is impeded by a longer term acidic milieu . Especially due to modern dietary habits, both acid erosion and caries represent a global disease affecting nearly 100% (dental caries) and 4-100% (dental erosion), respectively [12, 16, 17]. The majority of modern oral care strategies that address these conditions rely on fluorides. Fluoride compounds like Sodium Fluoride (NaF) or Stannous Fluoride (Sn(II)F2) are currently the most prominent remineralization systems in oral care. Fluoride ions, F-, are believed to enhance the natural enamel remineralization process and to inhibit demineralization [18, 19]. However, the underlying mechanisms of these properties are chemically not yet fully understood which is mainly due to the complex biological processes occurring within the oral cavity, such as interactions of fluorides with proteins and constituents of saliva . Topically applied fluorides are the proven mainstay of contemporary clinical caries prevention and their efficacy has been well documented in numerous clinical studies [21, 22]. Their identified preventive modes of action are manifold and in some aspects still not fully understood. Nevertheless, most experts agree that the single most important caries preventive property of topically applied fluorides is based on accelerating the reintegration of calcium phosphate mostly derived from saliva into demineralized surface lesions at the tooth-bacterial biofilm interface. However, exposure to extraordinary high fluoride levels can cause side effects like fluorosis and bone weakening [12, 23-30]. Therefore, the concentration of fluoride in oral care products is strictly regulated worldwide [22, 23, 31]. For example, in the EU, toothpastes are classified as cosmetic products and a maximum of 1500 ppm fluoride is allowed, and on average toothpastes with fluoride usually sold over the counter contain levels of around 1000 ppm [23, 31]. Besides, caries still develops in high-risk individuals, despite the numerous evidences of fluoride interventions having the most consistent benefit in preventing caries development and decelerating the progression of caries lesions. While the safety of the proper use of fluoridated toothpastes has been firmly established by numerous studies, dosage and toxicity aspects always have to be considered, particularly in children, where fluoride overdosing may result in the manifestation of mottled enamel or other signs of chronic fluorosis . Fluorides require calcium and phosphate ions from saliva to improve the natural remineralization process. Hyposalivation therefore, a common problem in elderly subjects, may significantly impair the preventive efficacy of topically applied fluorides. For xerostomia patients (e.g. induced by medications), oral care products with the addition of calcium and phosphate are recommended in order to compensate a calcium phosphate deficiency [32-35]. To overcome these drawbacks, increasing attention is given to the development of alternative non-fluoride agents that improve remineralization without having any possible side effects on the human body [35, 36]. The clinical use of calcium phosphate in caries protection by contrast is virtually free of comparable dosage and toxicity issues. Ideally, these agents should show equal or superior efficacy in remineralization compared to fluorides and provide an efficient caries protection in vivo. In the last years, biomimetic concepts along these lines have been developed in oral care with the aim to address these issues [1, 9, 37-41]. Especially in the field of enamel remineralization, calcium phosphates have been identified as promising biomimetic alternatives due to their similarity to natural enamel [1, 31, 35, 42-44]. It is assumed that calcium phosphate functions by infiltrating the micropores in early caries lesions, where it acts as crystal nuclei in the remineralization process by continuously attracting large amounts of calcium and phosphate ions from the oral fluids into the lesion, thus promoting natural remineralization processes [31, 42]. Besides remineralizing properties, in situ studies with hydroxyapatite have shown anti-adhesive properties that have the potential to be employed for a biomimetic biofilm control [45, 46]. Microorganisms tend to attach to free hydroxyapatite particles originating from toothpaste or mouthrinse and are thus cleared from the oral cavity, since they are deprived from colonizing the enamel . It is also reported that hydroxyapatite forms a protective layer on the enamel surface . Both remineralization concepts, i.e. calcium phosphates alone or in combination with fluorides have been realized in modern oral care products . However, it is important to know that combining calcium phosphates with fluorides within a toothpaste formulation may reduce the bioavailability of (ionic) fluoride in the oral cavity. This is due to the reaction of fluoride with calcium forming insoluble compounds such as Calcium Fluoride, CaF2, or Fluoroapatite, Ca5(PO4)3F [31, 47, 48]. The in-depth analysis and quantification of enamel remineralization in vivo is still a challenge in oral care research because most analytic methods are performed in vitro. In general, the remineralization process can be analyzed by different in vitro techniques such as Transverse Microradiography (TMR), Scanning Electron Microscopy (SEM) and nano- and microindentation [35, 46, 49-51]. In situ studies have gained increasing attention over the last years. In these experiments, individual patients wear bovine or human enamel test specimens, which are carried either on removable oral appliances or fixed on the natural teeth of the human subject. Within the oral cavity these specimens are in contact with saliva and salivary proteins, providing more realistic conditions compared to pure in vitro studies. After the exposure within the oral cavity, the specimens can be further analyzed by various analytical methods outside the oral cavity [35, 45, 52]. The calcium phosphate family contains many different compounds such as hydroxyapatite, β-tricalcium phosphate and dicalcium phosphate dihydrate (Table 2) [2, 53]. There is currently no comprehensive review article available that summarizes all published in vivo and in situ studies focusing solely on calcium phosphates as biomimetic ingredients without any additional remineralizing agents, such as fluorides. Therefore, the aim of this interdisciplinary review is to bridge this gap by introducing the large spectrum of different calcium phosphates and to summarize the state of the art of knowledge about their effects that have the potential to improve oral care products, such as the biomimetic remineralization of enamel as well as caries prevention with a focus on the latest in vivo and in situ studies. Table 1. pH-dependency of phosphoric acids and its salts . All these ions can interact with calcium ions, which lead to a huge variety of calcium phosphate phases. Books, reviews, and original research papers on in vivo and in situ studies were included. The databases PubMed® and SciFinder® were used for literature search. Calcium phosphates that are frequently utilized in oral care products were covered in this review and used as search terms alone and together with the following key words: in vivo, in situ, caries, clinical study, and remineralization. From 13,470 studies found, 35 studies complied with the inclusion criteria and were used for this review (Fig. 1). Fig. (1). Flow chart of study selection. In vivo and in situ studies were used for this review. After exclusion of all studies where calcium phosphates were used in combination with fluoride or where calcium phosphates were only mentioned e.g. as byproducts within the remineralization process, 35 studies remained and were included in this review. Enamel is organized in a hierarchical structure, starting on the molecular level with the hexagonal hydroxyapatite unit cell. Its properties in terms of dimensions of the crystallographic axes are a=9.441 Å and c=6.882 Å . Besides hydroxyapatite, many different calcium phosphate phases are known that can be formed under natural and synthetic conditions. This variation in calcium phosphates is brought about by the characteristics of Phosphoric Acid, H3PO4 [1, 2, 53]. Depending on the pH-value, different stages of deprotonation of H3PO4 can be observed, i.e. H2PO4- (Dihydrogen Phosphate), HPO42- (Hydrogen Phosphate), and PO43- (Phosphate) (Fig. 2, Table 1) . All of these ions can interact with calcium ions and water molecules, leading to many different calcium phosphates (Table 2). Fig. (2). Overview of phosphoric acid and its salts (for the pH-dependence (Table 1)). Table 2. Overview of different calcium phosphates with biological importance . Calcium phosphates frequently used in oral care products are highlighted (*). Additionally, further ions like Zn2+, Sr2+, Mg2+, Na+, CO32- as well as water molecules can be incorporated into the calcium phosphate crystal structure [1, 2, 53]. For example, Roveri et al. describe the synthesis and characterization of a biomimetic zinc substituted carbonated HAP mimicking the natural enamel crystallites that can be used for enamel remineralization . In addition to the pH-value and other factors, such as temperature, pressure and additives can affect the formation of the calcium phosphate phases, e.g. crystallite morphology and crystallite size [10, 56]. Commonly used calcium phosphates in biomimetic oral care are summarized in Table 3. To differentiate the various crystalline calcium phosphate phases, mainly X-ray powder diffraction is utilized. This technique allows identifying a single phase or a mixture of different phases. Rietveld-analysis can additionally be used to calculate the lattice parameters. Amorphous calcium phosphates cannot be routinely analyzed using these techniques due to the absence of a crystalline structure. Further techniques for analysis of chemical composition and microstructure include scanning electron microscopy, energy dispersive X-ray analysis and elemental analysis. Due to their similarity to natural bones and teeth, synthetic calcium phosphates offer an excellent biocompatibility while being non-toxic. Therefore, besides oral care, they are used in manifold biological and medical applications, for instance the coating of metallic implants, as drug delivery agent or bone cement . Out of all calcium phosphate phases, HAP, Ca5(PO4)3(OH), has the highest similarity to the natural enamel . Additionally, it has the lowest solubility of all calcium phosphates. HAP can be synthesized in different crystallite morphologies and particle sizes, i.e. from nanometer to micrometer size . Commonly used HAP particles in oral care applications are arranged in microclusters . Synthetic HAP particles were shown to interact both with enamel and dentin surfaces (Fig. 3) where they can unfold their effects such as the reduction of initial bacterial colonization [45, 46, 57]. Table 3. Overview of in vivo and in situ studies that were identified for the chosen calcium phosphates including aims, methods, and main outcomes. Please note that the presented calcium phosphates are mostly incorporated into oral care products like toothpastes and mouthrinses. The interaction of HAP particles with the enamel surface is crucial for the remineralization process. Anti-caries effects were shown in Japanese school children who received either a toothpaste with HAP or a toothpaste without HAP [31, 58]. The results after 3 years show that the mean DMFT-indices were significantly lower in the HAP group (1.45) than in the HAP-free group (3.29) representing a caries-reduction of 56% [31, 58]. In a clinical trial, enamel remineralization rate and enamel resistance against acids were tested using HAP. It could be shown that both improved after three days and three months, respectively . Another clinical study was able to show a reduction of the plaque formation rate of a HAP-containing toothpaste comparable to a amine- and stannous fluoride-containing toothpaste . The investigators also monitored gingival bleeding while probing, which was also reduced by using HAP-toothpaste . In addition to its remineralizing and anti-biofilm characteristics, HAP is used as a biomimetic abrasive in toothpaste formulations [31, 61]. A clinical study was able to show that HAP is as effective as Chlorhexidine (CHX) in plaque reduction and as effective as Fluoride (NaF) in remineralizing initial enamel lesions . The 81 children included in this study were separated equally into three different groups (HAP, CHX, NaF) and used the mouthwashes for at least eight weeks twice a day. After 1, 2, 4 and 6 weeks and two weeks after the end of the study plaque and gingival indices were examined as well as the mineral content of the enamel . The authors conclude that HAP is superior to CHX and NaF mouthrinses in combining the positive effects of two mouthrinses in one application . Two recent studies from Lelli et al. and Kensche et al. help understanding the action mechanisms of HAP. While Lelli et al. were able to detect a protective HAP-layer on enamel surfaces in an ex-vivo study , Kensche et al. used an in situ model detecting the anti-adhesive properties of the enamel-like calcium phosphate active ingredient . The formed protective HAP-layer was able to inhibit bacterial colonization on top of the enamel as well as acting as a buffer when acidic attacks occur [45, 46]. The effect is comparable to the effect of chlorhexidine, but the mechanism is not . While chlorhexidine leads to a widespread cell death, HAP simply reduces the microbial load due to anti-adhesive properties . This was also shown before using HAP as active ingredient in a mouthwash . HAP shows the same remineralization properties as fluoride systems (1100 ppm sodium fluoride) in situ . Najibfard et al. analyzed lesion depth and mineral content of extracted human third molars with and without (control) artificial enamel lesions to test the remineralizing properties of both systems. Each of the 30 participants used each of the toothpastes that were tested (5% HAP, 10% HAP, 1100 ppm NaF) for 28 days followed by a 7-days washout period. The authors conclude by propagating HAP usage instead of fluorides especially for children or patients suffering from xerostomia, because fluorides are potentially toxic and are strictly dependent on the availability of calcium and phosphates . Fig. (3). SEM-images of synthetic HAP-particles adhering to bovine enamel (a) and dentin (b) surfaces after having been applied in vitro. (a) Prismatic (p) and interprismatic enamel (ipe) can be clearly distinguished in this mildly etched sample (0.07 M phosphoric acid, 5 s), the synthetic particles are indicated by arrows. (b) Dentin surface of the same sample as (a), both exposed tubuli (encircled with dashed lines) and the bare surface are covered with synthetic HAP-particles (arrows). The affinity of the particles to the surface is higher for dentin than for enamel. (c) High magnification micrograph showing the structural similarity of HAP-particles (encircled with dashed lines) to the gently etched naturally formed HAP constituting the enamel. (d) Detail images show that the adhesion between enamel and particle is quite firm and individual crystallites at the interface can no longer be clearly associated to one or the other indicating a good mineral-mineral-interaction. Summarizing the results of these studies, HAP shows equivalent performance compared to the standard use of fluorides in oral care. There are two different tricalcium phosphates, Ca3(PO4)2, known, both of which cannot be found in pure form in nature . While α-tricalcium phosphate can only exist at high temperatures (above 1125 °C), β-TCP is stable at room temperature . β-TCP shows only a moderate solubility in water (25 mg/L at 25 °C) . The size of β-TCP powders differs depending on the milling-procedures, but mostly ranges between 0.01-5 µm [63, 64]. β-TCP is the bioavailable form of tricalcium phosphate that is used in products for medicine and oral care [2, 64]. Remineralization of eroded enamel is performed by calcium and phosphate originating from saliva. By using β-TCP, the concentration of calcium in the saliva can be increased (β-TCP is soluble at pH < 6). An in vivo study showed an increase of calcium in the saliva as consequence of acidic attacks and an acidic plaque-pH, when 2.5% β-TCP is used as additional compound in chewing gums . Compared to the control (conventional gum, without an additional calcium source), the pH increased (buffering of acidic attacks) as well as the concentrations of free calcium and free phosphates. Both can be used for remineralization, when the enamel is damaged by acidic attacks. This study also showed a deposition of β-TCP in plaque and saliva becoming available as soon as an acidic attack occurs . When using β-TCP, it is assumed that the concentration/content should be less than 1% (when used in combination with fluoride), because of possible interactions with fluorides, e.g. when both agents are used together in toothpastes (see above) [64, 65]. Calcium-phosphate complexes and calcium fluoride can be formed, lowering the bioavailability of both β-TCP and fluoride . However, Functionalized β-tricalcium Phosphate (ƒTCP) technology is currently used in certain brands of toothpaste with 5000 ppm fluoride and fluoride varnish with 5% NaF. In ƒTCP, by milling β-TCP with organic materials (functionalization) the calcium oxides in β-TCP become ‘protected’ by the organic materials (fumaric acid or sodium lauryl sulfate), thus allowing the calcium and phosphate ions of the β-TCP to coexist with fluoride ions in an aqueous dentifrice base (toothpaste or varnish) without premature β-TCP -fluoride interactions . When the toothpaste or varnish is applied intraorally, saliva degrades the protective coating, releasing calcium at the tooth surface, resulting in high fluoride and calcium ions bioavailability on the lesion surface, and subsequent diffusion into the lesion to promote remineralization. The ƒTCP technology has been investigated in mouthrinse and toothpaste tailored for in situ remineralization of dental caries  and acid erosion [68, 69]. When using β-TCP in toothpastes, surfactants should not contain carboxylic acids or Sodium Lauryl Sulfate (SLS) . Both can coat β-TCP, thus leading to a low extent of bioactive calcium and phosphate. The same can be observed when using polymers or copolymers i.e. PVM / MA Copolymer or PEG 8. PVM / MA is a combination of the two polymers (Poly)Methyl Vinyl Ether (PVM) and Maleic Anhydride (MA) and PEG-8 is known as Polyethylenglycol with 8 repetitions of ethylene (–CH2–CH2–O–) . These limitations lead to the suggestion to use β-TCP as remineralizing agent alone in toothpastes (without fluorides) and to carefully choose surfactants that do not inhibit the bioactivity of calcium. Furthermore, no polymers or copolymers should be used. However, the potential of β-TCP in oral care products for management of oral diseases has not been fully investigated in randomized clinical trials. Amorphous Calcium Phosphates (ACP), Cax(PO4)y ∙ n H2O, are mostly synthesized from the aqueous precipitation of calcium phosphates . The structure of ACP is mostly nano-crystalline, i.e. it has a short range order of very small dimensions in the range of a few interatomic distances. X-ray-diffraction confirms an amorphous character. ACP mostly occurs as spherical particles with an average diameter of 20-200 nm that can be visualized by SEM . It is suggested that ACP has apatite-like structures . ACP is well studied and mostly combined with Casein Phosphopeptides (CPP), which stabilize calcium in aqueous solutions . CPP is a natural peptide which can be derived from bovine milk by tryptic digestion of casein containing the protein-sequence Pse-Pse-Pse-Glu-Glu [70, 71]. Furthermore, CPP has been shown to increase the plaque-pH due to enzymatic breakdown of casein and a resulting increase of ammonia [31, 72]. A systematic review from 2014 included 738 studies, eight of which were used for further analysis . These in vivo studies intended to analyze the long-term remineralizing effects of CPP-ACP compared to placebo controls . The long-term effects on remineralizing carious lesions were superior compared to placebos and equivalent to fluorides. In addition to these results, CPP-ACP shows no side-effects such as calcified plaque. Using CPP-ACP with fluorides together in one formulation shows conflicting evidence and needs further research . Within a cohort of 191 children, tested CPP-ACP was found to reduce the percentage of Streptococcus mutans . While 8% of regular users of a cream containing this calcium phosphate were detected as S. mutans carriers, 47% of those who did not use CPP-ACP were colonized with S. mutans . These results do not directly show anticariogenic properties of CPP-ACP, but can be interpreted as hint for its ability to reduce potentially cariogenic bacteria. However, clinical relevance of in vivo remineralization with significant effects can be corroborated [73, 75]. Another clinical study used CPP-ACP in chewing gums and compared this to a xylitol-containing chewing gum. 60 children (aged 8-12 years) were included in this study and equally distributed within both groups. This study aimed to estimate the salivary flow rate, pH and buffering capacity . While salivary flow rate and pH showed no differences between the two groups, salivary buffer capacity was significantly higher in the ACP-CPP group than in the control group without CPP-ACP . A case report combining ACP-CPP and photo-activated disinfection to treat root caries supports these findings, since root surface caries could be stabilized . Within a clinical trial, CPP-ACP was used to examine the potential of regressing white-spot lesions with orthodontic patients . Even ICDAS II (International Caries Detection and Assessment System) code 2 and 3 lesions were regressed (31%) compared to placebo . Another 10 day in situ trial showed ACP-CPP being more effective in remineralizing enamel lesions compared to 1000 ppm fluoride and even 5000 ppm fluoride . Additionally to the demineralization of enamel by acids produced by bacteria, extrinsic acids can also attack the dental hard tissues (erosion). ACP was also confirmed to protect eroded teeth from erosive attacks. The authors describe the use of remineralizing agents in the case of erosion rather as precipitation template formation than as true remineralization . However, ACP (in combination with CPP) is as effective in recovering eroded enamel as fluorides used in typical concentrations within products for cosmetic use . Another study was not able to show reduction of erosion under the given in situ conditions by using CPP-ACP . These findings were supported using an in situ caries model where the investigators were not able to show a promotion of remineralization through CPP-ACP compared to fluoride control and fluoride/CPP-ACP control . In contrast to that, Kensche et al. demonstrated a decrease of acid-induced demineralization, however the effect was inferior to that of fluorides . Contrary to these results, a meta-analysis showed clear short-term remineralizing effects of CPP-ACP as well as long-term reduction of caries . This meta-analysis by Yengopal et al. from 2009 used in situ and in vivo studies concluded the anti-caries efficacy of CPP-ACP . In all cases, the participants used chewing gums supplemented with CPP-ACP. The amount of CPP-ACP ranged between 10.0 mg to 18.8 mg (in situ) and 54.0 mg (in vivo). Under the chosen in situ conditions, the percentage of remineralization with CPP-ACP was about 10% higher compared to no intervention or chewing gum without remineralizing agents, respectively (p=0.00001). The in vivo study included in this meta-analysis was performed as randomized clinical trial with 2720 participants over 24 months. After this period, the participants who received CPP-ACP supplemented chewing gums showed a reduction of progressing caries of 18% compared to the control group . ACP seems to be a promising candidate for remineralizing initial caries lesions and enamel eroded by acidic attacks, especially if applied directly before, during or after acid-intervention [64, 84]. However, the conditions of ACP synthesis / precipitation and consequently the use in toothpastes, mouth rinses and chewing gums need to be standardized to have the same quality in each application. Calcium phosphosilicate (CSPS) is a bioactive glass comprising 45% SiO2, 24.5% Na2O, 24.5% CaO and 6% P2O5 [64, 85]. This mineral was originally developed as bone-regenerative material because of its high biocompatibility and the ability to release calcium and phosphate ions [86, 87]. Besides occluding dentinal tubules and consequently desensitizing effects of this calcium phosphosilicate, there are also studies describing remineralizing potential as well as caries prevention and antiplaque-characteristics [64, 85, 88-95]. The active mechanism seems to be the delivery and deposition of calcium- and phosphate-ions that form a crystalline carbonated-apatite layer [31, 85]. Tai et al. Investigated the Plaque Index (PLI) and Bleeding Index (BLI) within a study with 100 subjects in a RCT over a six-week time period . In this study, CSPS was tested against a placebo-control and showed significant improve of oral health measured by a reduction of PLI and GBI . Nevertheless, the mode of action was not clarified by this study. Additionally, two in situ studies both from Parkinson et al. from 2017 used sodium monofluorophosphate with different concentrations as positive control and 5% CSPS as test dentifrice. They used also different concentrations of sodium monofluorophosphate in both studies (ranged from 0% to 0.15%) [94, 95]. The authors conclude in both studies no detectable improvements of 5% CSPS (alone or in comparison with sodium monofluorphosphate) compared to the positive (0.15 ppm sodium monofluorphosphate, 0% CSPS) or the negative control (0 ppm sodium monofluorphosphate, 0% CSPS) [94, 95]. CSPS as active compound in toothpastes seems to act as a calcium-reservoir that can be used for remineralization of demineralized enamel or dentine. Clinical studies with CSPS alone (not in combination with any fluorides) are needed to test the outcome for caries prevention in vivo. Plaque reduction and clear improvement of oral (gingival) health can be observed, when CSPS is used. In-situ studies were able to show non-inferiority to fluorides in case of remineralization. Unlike the bioglass described above, which required the addition of fluoride compounds such as sodium monofluorophosphate into the toothpaste formulation, a fluoride-containing bioactive glass was recently introduced as a caries remineralizing and preventive additive in toothpastes. Fluoridated Bioglass (f-BG) has fluoride, strontium, potassium and zinc incorporated within the glass itself, thus enabling simultaneous delivery of Sr2+, Ca2+, PO43− and F− ions into the initial caries lesions to promote remineralization by formation of a partially fluoridated crystal structure, zinc ions for bactericidal function, and potassium as a desensitizing agent. Having the fluoride incorporated within the glass prevents the risk of premature reaction of fluoride and calcium ions to Calcium Fluoride (CaF2), which reduces the bioavailability of the two ions [96, 97]. However, the lack of clinical studies does not permit any firm conclusions on their effectiveness. Calcium Glycerophosphate, C3H7CaO6P, (CGP) is the salt of glycerophosphoric acid. It is typically used as a food ingredient and a nutrition supplement . The first studies from 1972 evaluating the cariostatic effect of this organic calcium phosphate by Bowen used CGP as a nutrient supplement . Here, a group of monkeys (n=5) received 1% CGP as nutrient supplement. The control group (n=6) was fed with the same carbohydrate-rich diet as the experimental group, but without CGP. After a period of 30 months, the experimental group showed 8 carious lesions compared to 47 of the control group . Despite higher Ca2+-levels in the plaque of the experimental animals as well as higher pH-values after 20 min of sucrose administration, the total content of proteins and phosphate was the same in both groups . Brook et al. used CGP as nutrient supplement, too . Within a cohort of 14 children, the mean plaque levels were estimated between a group of children receiving 1% CGP 4 times daily and a group without any specific treatment. While plaque levels were increased in the experimental group, Ca2+ was not different . An even smaller study sample (n=8) did not clean their teeth for 18 days and rinsed with a 50%-sucrose solution . Optical changes were characterized as demineralization and could not be reduced by the addition of CGP (1%). Even topical applications of sodium fluoride (2%) were not able to inhibit these changes . Another study determined the accumulation of CGP in the dental plaque by having three different mouthrinse-interventions: (1) No CGP, (2) 0.5% CGP and (3) 1.5% CGP . The concentration of phosphate was significantly greater in the plaque in (3) compared to (1), indicating a higher potential for buffering acidic attacks . Forward  and Lynch  both postulated non-fluoride agents to modify the dental plaque with CGP or other agents  and enhance remineralization by enhancing calcium levels in the dental plaque to be promising factors for reducing dental caries [103, 104]. Calcium phosphates represent a group of common agents used in oral care that can be considered biomimetic due to the fact that the mineral phase of teeth consists of the same basic compound. Fluorides have been proven to efficiently reduce caries, but due to persistent high prevalence of this disease and the possible side effects of fluorides under certain conditions there is still a need to improve and also explore alternative ways for the prevention of tooth decay . Several different calcium phosphates are already clinically proven as anti-caries agents. Therefore, both fundamental studies on interaction mechanisms and further clinical studies on alternative, biomimetic agents are needed to help reduce the still high global caries prevalence. Among the different calcium phosphates, HAP and ACP have been most intensively studied and their efficiency in oral care has been shown in various in situ and in vivo studies. Therefore, they are clear favorites for the development of innovative biomimetic oral care concepts. However, the potential of other calcium phosphates for oral care applications should be analyzed in further studies. HAP and ACP show manifold activity in reduction of biofilms and remineralization of enamel and dentin. In contrast to fluorides, calcium phosphates are ideally suited especially for young children and individuals suffering from hyposalivation. In conclusion, calcium phosphates represent a promising innovative approach for daily oral care that will broaden the range of future treatments in preventive dentistry. Enax J, Epple M. Synthetic hydroxyapatite as a biomimetic oral care agent. Oral Health Prev Dent 2018; 16(1): 7-19. Dorozhkin SV, Epple M. Biological and medical significance of calcium phosphates. Angew Chem Int Ed Engl 2002; 41(17): 3130-46. Lowenstam HA, Weiner S. On Biomineralization 1989. Enax J, Prymak O, Raabe D, Epple M. Structure, composition, and mechanical properties of shark teeth. J Struct Biol 2012; 178(3): 290-9. Engel J. Biomineralization processes for future research A critical survey of biomineralization: Control, mechanisms, functions and material properties 2017; 59-62. Moradian-Oldak J. Protein-mediated enamel mineralization. Front Biosci 2012; 17: 1996-2023. Moll K-J, Moll M. Kurzlehrbuch Anatomie 2000. Moradian-Oldak J. The regeneration of tooth enamel. Dimens Dent Hyg 2009; 7(8): 12-5. Lübke A, Enax J, Wey K, Fabritius HO, Raabe D, Epple M. Composites of fluoroapatite and methylmethacrylate-based polymers (PMMA) for biomimetic tooth replacement. Bioinspir Biomim 2016; 11(3): 035001. Chen H, Tang Z, Liu J, Sun K, Chang S-R, Peters MC, et al. Acellular synthesis of a human enamel-like microstructure. Adv Mater 2006; 18: 1846-51. Clarkson BH, Exterkate RAM. Noninvasive dentistry: A dream or reality? Caries Res 2015; 49(Suppl. 1): 11-7. Fejerskov O, Kidd E. Dental caries: The disease and its clinical management 2009. Dawes C. What is the critical pH and why does a tooth dissolve in acid? J Can Dent Assoc 2003; 69(11): 722-4. Edgar WM, O’Mullane DM. Saliva and oral health 2nd ed. 1996. Abou Neel EA, Aljabo A, Strange A, et al. Demineralization-remineralization dynamics in teeth and bone. Int J Nanomedicine 2016; 11: 4743-63. Lussi A, Ganss C, Eds. Erosive tooth wear: From diagnosis to therapy 2014. Lussi A, Hellwig E, Klimek J. Fluorides - mode of action and recommendations for use. Schweiz Monatsschr Zahnmed 2012; 122(11): 1030-42.
 ten Cate JM. Contemporary perspective on the use of fluoride products in caries prevention. Br Dent J 2013; 214(4): 161-7. Oh HJ, Oh HW, Lee DW, et al. 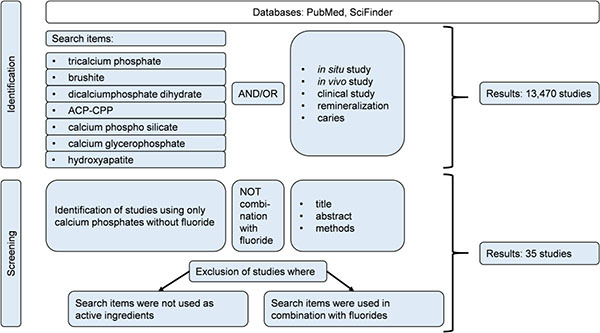 Chronologic trends in studies on fluoride mechanisms of action. J Dent Res 2017; 96(12): 1353-60. Marinho VC. Cochrane reviews of randomized trials of fluoride therapies for preventing dental caries. Eur Arch Paediatr Dent 2009; 10(3): 183-91. Walsh T, Worthington HV, Glenny AM, Appelbe P, Marinho VC, Shi X. Fluoride toothpastes of different concentrations for preventing dental caries in children and adolescents. Cochrane Database Syst Rev 2010; (1): CD007868. Limeback H, Robinson C. Fluoride therapy Comprehensive preventive dentistry 2012; 251-82. Denbesten P, Li W. Chronic fluoride toxicity: Dental fluorosis. Monogr Oral Sci 2011; 22: 81-96. Whitford GM. Acute toxicity of ingested fluoride. Monogr Oral Sci 2011; 22: 66-80. Krikheli NI, Karamysheva EI, Lukina GI, Dubova LV. [Mineral composition of mixed saliva in patients with dental fluorosis]. Stomatologia (Mosk) 2017; 96(6): 26-9. Verma A, Shetty BK, Guddattu V, Chourasia MK, Pundir P. High prevalence of dental fluorosis among adolescents is a growing concern: A school based cross-sectional study from Southern India. Environ Health Prev Med 2017; 22(1): 17. Van Loveren C. M. C. D. N. J. M. Huysmans, A.Lussi, H.-P- Weber, Eds. Toothpastes: Monographs in oral science. Karger: Basel 2013; 23. Su N, Marek CL, Ching V, Grushka M. Caries prevention for patients with dry mouth. J Can Dent Assoc 2011; 77: b85. Papas A, Russell D, Singh M, Kent R, Triol C, Winston A. Caries clinical trial of a remineralising toothpaste in radiation patients. Gerodontology 2008; 25(2): 76-88. Sreebny LM, Schwartz SS. A reference guide to drugs and dry mouth. Gerodontology 1997; 14(1): 33-47. Najibfard K, Ramalingam K, Chedjieu I, Amaechi BT. Remineralization of early caries by a nano-hydroxyapatite dentifrice. J Clin Dent 2011; 22(5): 139-43. Gutkowski S. Mechanical Plaque Removal Comprehen Prevent Dentistry 2012; 119-45. Meyer F, Fabritius H, Enax J. Spezielle Zahnpflege bei Dentinhypersensibilität. ZMK 2017; 33: 865-8. Niu LN, Zhang W, Pashley DH, et al. Biomimetic remineralization of dentin. Dent Mater 2014; 30(1): 77-96. Roveri N, Battistella E, Bianchi CL, et al. Surface enamel remineralization: Biomimetic apatite nanocrystals and fluoride ions different effects. J Nanomater 2009; 9. Roveri N, Battistella E, Foltran I, et al. Synthetic biomimetic carbonate-hydroxyapatite nanocrystals for enamel remineralization. Adv Mat Res 2008; 47-50: 821-4. Enax J, Janus AM, Raabe D, Epple M, Fabritius HO. Ultrastructural organization and micromechanical properties of shark tooth enameloid. Acta Biomater 2014; 10(9): 3959-68. Amaechi BT, van Loveren C. Fluorides and non-fluoride remineralization systems. Monogr Oral Sci 2013; 23: 15-26. Hannig M, Hannig C. Nanomaterials in preventive dentistry. Nat Nanotechnol 2010; 5(8): 565-9. Kensche A, Holder C, Basche S, Tahan N, Hannig C, Hannig M. Efficacy of a mouthrinse based on hydroxyapatite to reduce initial bacterial colonisation in situ. Arch Oral Biol 2017; 80: 18-26. Lelli M, Putignano A, Marchetti M, et al. Remineralization and repair of enamel surface by biomimetic Zn-carbonate hydroxyapatite containing toothpaste: A comparative in vivo study. Front Physiol 2014; 5: 333. Eggert F, Neubert R. In vitro investigation of the liberation of fluoride ions from toothpaste compounds in a permeation model. Eur J Pharm Biopharm 1999; 47(2): 169-73. Huang SB, Gao SS, Yu HY. Effect of nano-hydroxyapatite concentration on remineralization of initial enamel lesion in vitro. Biomed Mater 2009. Poggio C, Gulino C, Mirando M, Colombo M, Pietrocola G. Protective effect of zinc-hydroxyapatite toothpastes on enamel erosion: An in vitro study. J Clin Exp Dent 2017; 9(1): e118-22. Esteves-Oliveira M, Santos NM, Meyer-Lueckel H, Wierichs RJ, Rodrigues JA. Caries-preventive effect of anti-erosive and nano-hydroxyapatite-containing toothpastes in vitro. Clin Oral Investig 2017; 21(1): 291-300. Tschoppe P, Zandim DL, Martus P, Kielbassa AM. 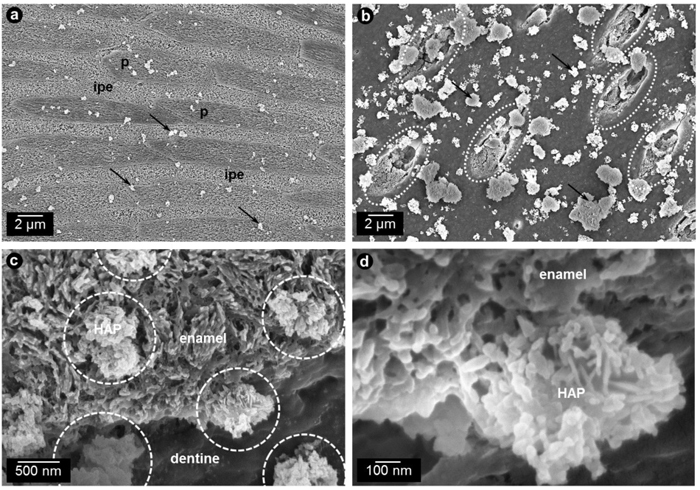 Enamel and dentine remineralization by nano-hydroxyapatite toothpastes. J Dent 2011; 39(6): 430-7. Hannig C, Gaeding A, Basche S, Richter G, Helbig R, Hannig M. Effect of conventional mouthrinses on initial bioadhesion to enamel and dentin in situ. Caries Res 2013; 47(2): 150-61. Brown PW, Constantz B. Hydroxyapatite and related materials 1994. LeGeros RZ. Apatites in biological systems. Prog Cryst Growth Charact 1981; 4: 1-45. Holleman AF, Wiberg E. Lehrbuch der Anorganischen Chemie. Scientific Res 1995. Wu Y-J, Tseng Y-H, Chan JCC. Morphology control of fluorapatite crystallites by citrate ions. Cryst Growth Des 2010; 10: 4240-2. Hannig C, Basche S, Burghardt T, Al-Ahmad A, Hannig M. Influence of a mouthwash containing hydroxyapatite microclusters on bacterial adherence in situ. Clin Oral Investig 2013; 17(3): 805-14. Kani K, Kani M, Isozaki A, Shintani H, Ohashi T, Tokumoto T. Effect of apatite-containing dentifrices on dental caries in school children. J Dent Health 1989; 19: 104-9. Makeeva IM, Polyakova MA, Avdeenko OE, Paramonov YO, Kondrat’ev SA, Pilyagina AA. Effect of long term application of toothpaste Apadent Total Care Medical nano-hydroxyapatite. Stomatologia (Mosk) 2016; 95(4): 34-6. Harks I, Jockel-Schneider Y, Schlagenhauf U, et al. Impact of the daily use of a microcrystal hydroxyapatite dentifrice on de novo plaque formation and clinical/microbiological parameters of periodontal health. A randomized trial. PLoS One 2016; 11(7): e0160142. Enax J, Epple M. Die Charakterisierung von Putzkörpern in Zahnpasten. Dtsch Zahnarztl Z 2018; 73: 100-8. Hegazy SA, Salama IR. Antiplaque and remineralizing effects of Biorepair mouthwash: A comparative clinical trial. Pediatr Dent J 2016; 26: 89-94. Information. NCfB. PubChem Compound Database; CID=24456. 2017. Walsh L. Contemporary technologies for remineralisation therapies: A review. Int Dent SA 2009; 11: 6-16. Vogel GL, Zhang Z, Carey CM, Ly A, Chow LC, Proskin HM. Composition of plaque and saliva following a sucrose challenge and use of an alpha-tricalcium-phosphate-containing chewing gum. J Dent Res 1998; 77(3): 518-24. Karlinsey RL, Pfarrer AM. Fluoride plus functionalized β-TCP: A promising combination for robust remineralization. Adv Dent Res 2012; 24(2): 48-52. Karlinsey R, Mackey A, Walker E, et al. Remineralization potential of 5,000 ppm fluoride dentifrices evaluated. J Dent Oral Hyg 2010; 02: 1-6. Amaechi BT, Karthikeyan R, Mensinkai PK, Najibfard K, Mackey AC, Karlinsey RL. Remineralization of eroded enamel by a NaF rinse containing a novel calcium phosphate agent in an in situ model: A pilot study. Clin Cosmet Investig Dent 2010; 2: 93-100. Mathews MS, Amaechi BT, Ramalingam K, et al. In situ remineralisation of eroded enamel lesions by NaF rinses. Arch Oral Biol 2012; 57(5): 525-30. Cross KJ, Huq NL, Reynolds EC. Casein phosphopeptides in oral health: Chemistry and clinical applications. Curr Pharm Des 2007; 13(8): 793-800. Sato R, Noguchi T, Naito H. Casein Phosphopeptide (CPP) enhances calcium absorption from the ligated segment of rat small intestine. J Nutr Sci Vitaminol (Tokyo) 1986; 32(1): 67-76. Reynolds EC, Riley PF. Protein dissimilation by human salivary-sediment bacteria. J Dent Res 1989; 68(2): 124-9. Li J, Xie X, Wang Y, et al. Long-term remineralizing effect of Casein Phosphopeptide-Amorphous Calcium Phosphate (CPP-ACP) on early caries lesions in vivo: A systematic review. J Dent 2014; 42(7): 769-77. Pukallus ML, Plonka KA, Holcombe TF, Barnett AG, Walsh LJ, Seow WK. A randomized controlled trial of a 10 percent CPP-ACP cream to reduce mutans streptococci colonization. Pediatr Dent 2013; 35(7): 550-5. Gupta N, Mohan Marya C, Nagpal R, Singh Oberoi S, Dhingra C. A Review of casein phosphopeptide-amorphous calcium phosphate (CPP-ACP) and enamel remineralization. Compend Contin Educ Dent 2016; 37(1): 36-9. Hegde RJ, Thakkar JB. Comparative evaluation of the effects of casein phosphopeptide-amorphous calcium phosphate (CPP-ACP) and xylitol-containing chewing gum on salivary flow rate, pH and buffering capacity in children: An in vivo study. J Indian Soc Pedod Prev Dent 2017; 35(4): 332-7. Vlacic J, Meyers IA, Walsh LJ. Combined CPP-ACP and Photoactivated Disinfection (PAD) therapy in arresting root surface caries: A case report. Br Dent J 2007; 203(8): 457-9. Bailey DL, Adams GG, Tsao CE, et al. Regression of post-orthodontic lesions by a remineralizing cream. J Dent Res 2009; 88(12): 1148-53. Shen P, Manton DJ, Cochrane NJ, et al. Effect of added calcium phosphate on enamel remineralization by fluoride in a randomized controlled in situ trial. J Dent 2011; 39(7): 518-25. Wiegand A, Attin T. Randomised in situ trial on the effect of milk and CPP-ACP on dental erosion. J Dent 2014; 42(9): 1210-5. Meyer-Lueckel H, Wierichs RJ, Schellwien T, Paris S. Remineralizing efficacy of a CPP-ACP cream on enamel caries lesions in situ. Caries Res 2015; 49(1): 56-62. Kensche A, Pötschke S, Hannig C, Richter G, Hoth-Hannig W, Hannig M. Influence of calcium phosphate and apatite containing products on enamel erosion. Sci World J 2016; 2016: 7959273. Yengopal V, Mickenautsch S. Caries preventive effect of Casein Phosphopeptide-Amorphous Calcium Phosphate (CPP-ACP): A meta-analysis. Acta Odontol Scand 2009; 67(6): 321-32. Ceci M, Mirando M, Beltrami R, Chiesa M, Poggio C. Protective effect of casein phosphopeptide-amorphous calcium phosphate on enamel erosion: Atomic force microscopy studies. Scanning 2015; 37(5): 327-34. Burwell AK, Litkowski LJ, Greenspan DC. Calcium sodium phosphosilicate (NovaMin): Remineralization potential. Adv Dent Res 2009; 21(1): 35-9. Hench LL, Andersson Ö. Bioactive glasses: An Introduction to bioceramics 2011; 41-62. Andersson OH, Kangasniemi I. Calcium phosphate formation at the surface of bioactive glass in vitro. J Biomed Mater Res 1991; 25(8): 1019-30. Gillam DG. Dentine hypersensitivity: Advances in diagnosis, management, and treatment 2015. Tai BJ, Bian Z, Jiang H, et al. Anti-gingivitis effect of a dentifrice containing bioactive glass (NovaMin) particulate. J Clin Periodontol 2006; 33(2): 86-91. Hoffman DA, Clark AE, Rody WJ Jr, McGorray SP, Wheeler TT. A prospective randomized clinical trial into the capacity of a toothpaste containing NovaMin to prevent white spot lesions and gingivitis during orthodontic treatment. Prog Orthod 2015; 16: 25. Reynolds EC. Calcium phosphate-based remineralization systems: Scientific evidence? Aust Dent J 2008; 53(3): 268-73. Vahid Golpayegani M, Sohrabi A, Biria M, Ansari G. Remineralization effect of topical NovaMin versus sodium fluoride (1.1%) on caries-like lesions in permanent teeth. J Dent (Tehran) 2012; 9(1): 68-75. Alexandrino LD, Alencar CM, Silveira ADSD, Alves EB, Silva CM. Randomized clinical trial of the effect of NovaMin and CPP-ACPF in combination with dental bleaching. J Appl Oral Sci 2017; 25(3): 335-40. Parkinson CR, Siddiqi M, Mason S, Lippert F, Hara AT, Zero DT. In situ study to confirm the anticaries potential of a sodium monofluorophosphate dentifrice containing calcium sodium phosphosilicate. J Clin Dent 2017; 28(2): 27-31. Parkinson CR, Siddiqi M, Mason S, Lippert F, Hara AT, Zero DT. Anticaries potential of a sodium monofluorophosphate dentifrice containing calcium sodium phosphosilicate: Exploratory in situ randomized Trial. Caries Res 2017; 51(2): 170-8. Mneimne M, Hill RG, Bushby AJ, Brauer DS. High phosphate content significantly increases apatite formation of fluoride-containing bioactive glasses. Acta Biomater 2011; 7(4): 1827-34. Information. NCfB. PubChem Compound Database; CID=120096. 2018. Bowen WH. The cariostatic effect of calcium glycerophosphate in monkeys. Caries Res 1972; 6(1): 43-51. Brook AH, Gawthorpe J, Winter GB. Calcium glycerophosphate and dental plaque. Clinical pilot study. Caries Res 1975; 9(2): 156-62. Edgar WM, Geddes DAM, Jenkins GN, Rugg-Gunn AJ, Howell R. Effects of calcium glycerophosphate and sodium fluoride on the induction in vivo of caries-like changes in human dental enamel. Arch Oral Biol 1978; 23(8): 655-61. Wycoff SJ, Morris ME, Newbrun E. The effect of mouthrinse containing calcium glycerophosphate on the chemical composition and development of plaque in humans. J Dent Res 1980; 59(1): 23-8. Forward GC. Non-fluoride anticaries agents. Adv Dent Res 1994; 8(2): 208-14. Lynch RJ. Calcium glycerophosphate and caries: A review of the literature. Int Dent J 2004; 54(5)(Suppl. 1): 310-4. Edgar WM, Geddes DA, Jenkins GN, Rugg-Gunn AJ, Howell R. Effects of calcium glycerophosphate and sodium fluoride on the induction in vivo of caries-like changes in human dental enamel. Arch Oral Biol 1978; 23(8): 655-61.